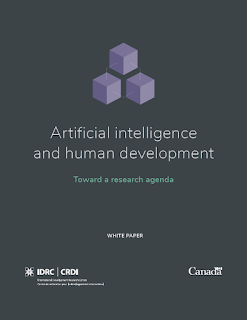 July 29, 2018 at 11:36PM Research Blog | Centre for Studies in Science Policy New Report "Artificial Intelligence and Human Development: Toward a Research Agenda"
by Matthew Smith, & Sujaya Neupane, International Development Research Center, Canada, 2018. Abstract: Like most new technologies, Artificial Intelligence (AI) has the potential to exacerbate existing problems, reinforce structural inequalities, and superimpose biases. This paper proposes a proactive research agenda for the ethical and equitable application of AI in the Global South, drawn from a broad overview of technologies associated with AI capabilities, and the opportunities and challenges they present. Three areas are identified in which action can be taken: policies and regulations; inclusive and ethical AI applications; and infrastructure and skills. Within each area, the paper makes recommendations for research necessary to make concrete progress. Discussion Paper on National Strategy for Artificial Intelligence, by NITI Aayog, New Delhi, 2018.